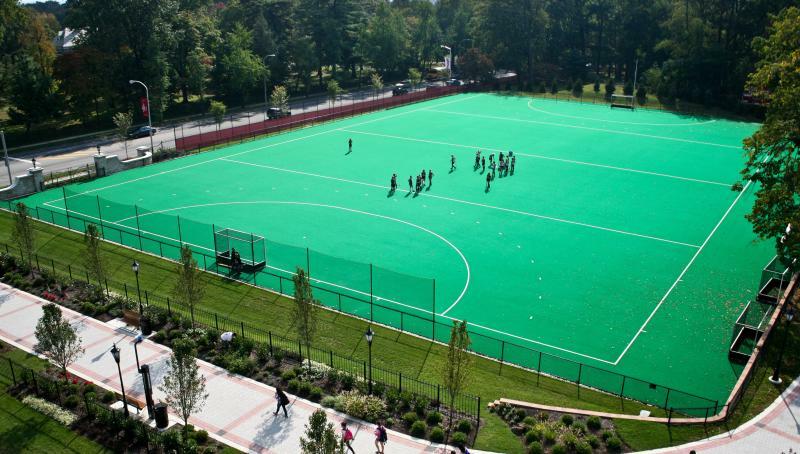 The Saint Joseph's field hockey program entered a new era in 2011 as the Hawks began play at Ellen Ryan Field, their brand new turf field on the James J. Maguire '58 Campus. The new field is named in honor of longtime athletic administrator Ellen Ryan, who retired in August of 2011 after 37 years at Saint Joseph's. The first game, a contest against Delaware, was held on September 24, while the facility was officially dedicated on October 7 before a matchup with local rival Temple. Prior to the opening of Ryan Field, the Hawks played their home games at a number of off-campus sites; SJU last played a home game on-campus in November of 2007. Ryan Field has a synthetic AstroTurf12 pitch and is situated adjacent to City Avenue on the Maguire Campus. The surface is one of the most popular in the game and conforms to International Hockey Federation standards. The facility is also equipped with an irrigation drainage system, state-of-the-art pop-up water cannons designed to give the surface a more consistent feel, a mobile press box, and seating for up to 200 spectators. "When you think of women's athletics at Saint Joseph's, the first name you think of is, and should be, Ellen Ryan," said Director of Athletics Don DiJulia. "We hope that by putting her name on this field, the University can honor her contributions now and forever." "I was thrilled when I was informed that the hockey field was being named for me," said Ryan. "I've had so many wonderful experiences over my 37 years at Saint Joseph's, but the naming of the field is the ultimate compliment. It will bring me great pride and joy to watch the field hockey program succeed on Ryan Field." "There is no better person to bestow this honor upon than Ellen Ryan," said Saint Joseph's head field hockey coach Michelle Finegan. "The team and I are grateful to Ellen for everything she has done for us, both in regards to the field project and through her service to the University. We cannot wait to begin practicing and playing on Ellen Ryan Field." Ryan was the driving force behind the growth of the Saint Joseph's women's athletics program during her tenure on Hawk Hill. She served as the first head coach of the women's basketball team in 1973, temporarily adding the head coaching duties of the women's tennis team to her résumé in 1976. Ryan was the coordinator of women's athletics for six years before being named assistant athletic director in 1981. In 2002, she was promoted to the position of associate athletic director/senior women's administrator, which she held until her retirement. Due to limited parking availability on the Maguire Campus, we ask that fans attending games at Ellen Ryan Field park in the Hawks' Landing parking facility on 54th Street and walk to Ellen Ryan Field.